Is it possible to give player of the match award to more than one player, when the stats and performances of more than one player (from the same team) equals the same? If yes, any history for the above? As the question is about sharing the player of the match award between two players from same team, here is the example for that in an international match. Sunil Gavaskar and Chetan Sharma shared the "Man of the match" award in World Cup 87. Yes, it's possible to share the Man of the Match award between two players of the same team. 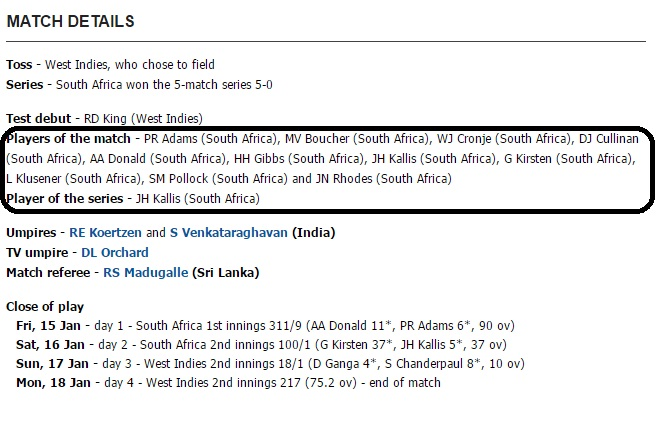 HH Gibbs (South Africa) and RT Ponting (Australia) were name the players of the match. In January 1999, all the eleven players of the team got player of the match award in a test match between WestIndies and SouthAfrica. Not the answer you're looking for? Browse other questions tagged cricket history icc awards or ask your own question. What happens if the result of match was found wrong after the match day? When did the fifty-overs format for One-day international matches comes in practice? Was there a golden ball award for the World cup prior 1978? Is there a Sixth Man of the Year Award equivalent in other sports?